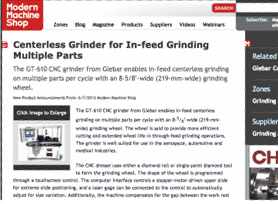 The GT-610 CNC grinder from Glebar enables in-feed centerless grinding on multiple parts per cycle with an 8-5/8"-wide (219-mm-wide) grinding wheel. The wheel is said to provide more efficient cutting and extended wheel life in through-feed grinding operations. The grinder is well-suited for use in the aerospace, automotive and medical industries.